Halloween is a great time of year that allows people to dress up, party, and enjoy various treats. Instead of the typical Halloween candy, many parties will include tasty appetizers, snacks, and desserts. However, most Halloween candy doesn’t complement a healthy diet. 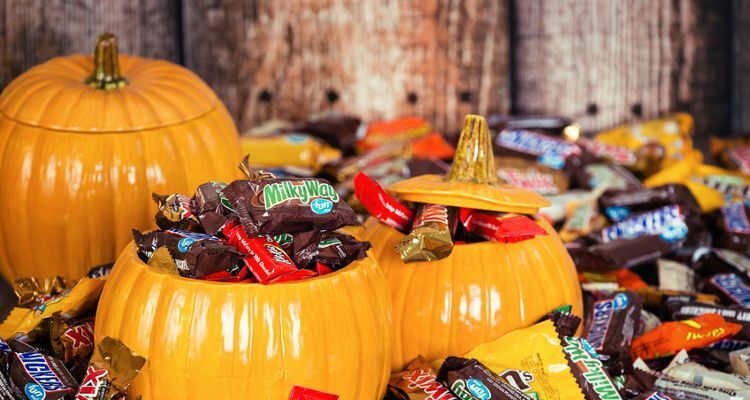 Luckily, you can make your own healthy Halloween candy. Healthy food can easily replace the unhealthy Halloween treats that are often served at parties or given to children for trick-or-treating. High-sugar and chemical-ridden candies and treats can be found everywhere around Halloween. Rather than binging on Halloween candy and chocolate bars, it is possible to satisfy your cravings for sweet treats without guilt. The following are a few healthy snacks and desserts that are perfect for your upcoming Halloween celebration. Try these healthy substitutes for yourself! The chocolate bark recipe is loaded with antioxidants and free from refined sugar. Not only is it a great Halloween treat, it is a great recipe for a dessert or gift during the holidays. The following recipe will serve about eight people. 1/2 cup of virgin coconut oil, 1/2 cup of organic cacao powder, 1/2 tsp. of vanilla extract, 1/4 cup of maple syrup, A pinch of sea salt, 1/2 cup of raw shelled pistachios, 1/2 cup of dried and chopped apricots. Preheat the oven 350 degrees Fahrenheit, and place pistachios on a baking sheet lined with parchment paper. Bake for six or seven minutes, or until they are lightly golden. Set aside to cool, then roughly chop and set aside. In a small saucepan, heat coconut oil on low until melted. Take it off the heat and whisk in cacao powder on low until it is smooth. Add vanilla extract, sea salt, and maple syrup. Add about half of the chopped apricots and half the chopped pistachios. Prepare another baking sheet with parchment paper, and pour the chocolate mixture over the paper with about a quarter-inch of thickness. Sprinkle the top with the rest of the chopped apricots and pistachios, and a little bit of sea salt. Place the baking sheet on a flat surface in the freezer, and let the chocolate bark set for 15 to 20 minutes, or until totally firm. Break the bark into pieces and serve. These chocolate almond buttercups are a great replacement for Reese’s Peanut Butter Cups. You could also make it nut free by replacing the almonds and almond meal. This recipe will also only take about 35 minutes to make! You could use your favorite nut butter in this easy and healthy recipe, and add salt for a little more taste. 3/4 cup of cacao butter, 3 tbsps. of cacao powder, 1/2 cup of almond meal, 3 tbsp. of maple syrup, 13 tsps. of almond butter, 13 mini-sized paper baking cups (1 5/8-inch diameter). Melt the cacao butter in the sun of over very low heat on the stove. Once melted, add almond meal, cacao powder, and maple syrup. Mix well, and taste. Add more cacao if you prefer richer chocolate. Add more maple syrup if you want a sweeter taste. Spoon one teaspoon of the chocolate mixture into the baking cups, and fill one-third of the way. Reserve the other half of mixture for the tops of cups. Put the baking cups in the freezer for five minutes to set. Remove cups from the freezer, and add one teaspoon of almond butter to each. Each cup should now be two-thirds full. Add one and half teaspoons of the remainder chocolate mixture into the baking cups, and place in the freezer again and set for 15 minutes. Do you sometimes crave gummy candy, but don’t want the guilt that comes with it? Try a gummy candy made with beets. Yes, you heard me right. Baby beets (Use as many as you would like), Plums, Figs. Steam baby beets until it is tender for about 15 minutes. Place the baby beets into a dehydrator at 150 degrees Fahrenheit for 10 hours, or in the oven for overnight. Remove from the oven and let cool. Serve with fresh cut plums and figs. For those that are totally nut free, you should definitely make this sesame seed-based recipe. Besides for Halloween, it is also a great dessert recipe after an Asian-inspired dish like stir-fry. The following recipe will make about a dozen truffles. Double the recipe to yield more. 2 tbsp. of sesame seeds for coating. In a large mixing bowl combine softened coconut butter, shredded coconut, tahini, sea salt, vanilla bean or extract, and cinnamon until mixture is smooth. If using vanilla bean, you will slice it down the center and run the back of your knife along the inside edges of the pod to scrape out seeds. Form the mixture into one-inch balls, and roll each one in the sesame seeds or your choice of coating like shredded coconut, or choose black or white sesame seeds. Set the truffles on a plate, and solidify in the refrigerator. Rees, S., “How to Make Your Own Healthy Halloween Candy,” Vogue web site, Oct. 24, 2016; http://www.vogue.com/13495908/healthy-halloween-candy-recipes/.